The CRC/Transregio 237 "Nucleic Acid Immunity" is one of three new large-scale projects at the LMU that will be funded by the Deutsche Forschungsgemeinschaft (DFG). The focus of the new CRC/Transregio are mechanisms to detect and eliminate foreign genetic material. 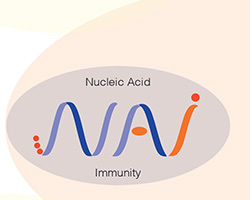 Within the new CRC/Transregio, scientists want to understand the molecular mechanisms of nucleic acid immunity and examine how disturbances of this machinery contribute to the formation of diseases - for example chronic infections and autoimmune diseases. The here-obtained results should also enable the development of new, targeted therapies and therapeutic vaccines. Speaker of the CRC/Transregio is Gunter Hartmann of the University of Bonn. In Munich, the project is headed by Veit Hornung of the Gene Center Munich. Participating groups at the Gene Center are the groups of Karl-Peter Hopfner, Karl-Klaus Conzelmann and Veit Hornung.